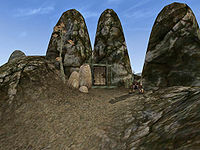 Abebaal Egg Mine is on the north side of the island northwest of Tel Branora, run by Telvanni and staffed by slaves. It is a moderately sized, Telvanni-operated egg mine located in southeastern Vvardenfell on Azura's Coast between Tel Branora and Molag Mar. The mine is rich in kwama eggs but doesn't contain much in the way of other loot. It is currently worked by six Telvanni-owned slaves. The slaves are in a state of revolt against the mad demands of Mistress Therana, and as a member of House Telvanni, you are sent to the mine to quell the uprising. The key to the slave bracers is located inside a crate found in the Kwama Queen's chamber. If you talk to the slave leader Eleedal-Lei and give him the key, he will free all other slaves. Other copies of the key are on Mistress Therana and in a desk in Lower Tel Branora. If you collect slave bracers to keep track of how many slaves you have freed, after you give the key to Eleedal-Lei and leave the mine the slaves will disappear with him and you will find all the bracers in a nice little pile right inside the door.